A study by the government of the Australian state of Victoria highlights the limits of electric cars, in isolation, to reduce greenhouse gas emissions. The Victorian government’s ongoing “electric vehicle trial” [PDF] found that electric cars powered by coal may actually produce more carbon emissions than petroleum-fueled cars over the lifetime of the vehicle, from manufacturing to junkyard. This is due in part to the added environmental impacts of the lithium batteries that electric cars require. This is not to say that EVs won’t improve on internal combustion engines. It all depends on where the electricity comes from. The authors found that, taking into account the full vehicle life-cycle, an electric car powered by 100 percent renewable energy — like wind and solar — can begin outperforming gas-powered cars after two years of use. In the United States, the cleanest sources of electricity are near the coasts, and EVs in those areas outperform the best hybrids, according to a study by the Union of Concerned Scientists released last spring. But in the Midwest and Mountain West, coal-powered energy generation makes EVs dirtier. Of course, even setting aside the deaths, injuries, chronic diseases, and traffic jams caused by a car-dependent transportation system, vehicle emissions are far from the only environmental cost of cars. To reduce global greenhouse gas emissions, cutting down on the “embedded energy” that comes with sprawling development is absolutely essential. And while cleaner cars can help curb global warming, the wrong incentives for their use can also dump more carbon into the air. To the extent that policies discourage transit, biking, or walking in order to favor electric vehicles, the net effect can actually backfire. Witness Denmark’s incentives to park electric cars in the center city, which undermines the high mode-share for greener modes of travel. 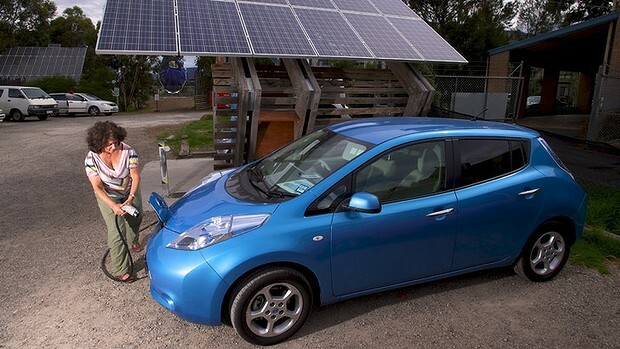 The Australian government has been providing a better incentive, helping gas stations install electric vehicle charging facilities. The city of Melbourne currently has about 30 such stations in the central business district but 10 more are on the way as part of a government trial, reports Melbourne’s The Age. 1) You can more tightly control emissions from a coal-powered generating station than you can on a gasoline-powered car. Moreover, eventually I feel coal-powered powerplants will require carbon sequestration of some sort. 2) A gasoline-powered vehicle emits pollutants in areas where people live, while coal plants are often in remote areas. That alone is a big plus for EVs, even if the emissions are the same. 3) EVs mitigate the noise pollution associated with internal combustion engines. That’s particularly true for large, diesel-powered vehicles. I too would rather see us focus more on transit, walking, and biking. However, we’ll still need some motor vehicles for emergency, delivery, and transit. I’d much rather they be EVs. I understand that “car culture” has to be challenged, but I really have to disagree with the criticisms I hear on this site frequently about EVs and autonomous vehicles. Joe R. has good points about point-source pollution being easier to manage (remoteness, sequestration, upgrades). But I have read many reputable studies that claim the opposite — that even running on coal electricity, by far the worst form, it’s still cleaner than ICE. Autonomous EVs will produce zero smog, be able to charge themselves and will drive better and safer than even the most alert and responsible human motorist. They will limit pedestrian, bicyclist and motorist deaths, and they even have a role to play in public transit (autonomous buses running clean energy should be our goal in major cities). Solar panels are dropping in price exponentially, and unless we have an energy revolution we are all blighted anyway. I know it often feels like we have limited resources and focus, and so anything that detracts from walking, biking and mass transit is bad, but that’s way too simplistic of a view. Also, we have to live in reality — it’s a reality where people are moving to cities in higher numbers and driving in fewer, but it’s also a reality where cars will continue to be a dominant mode of transportation for the next couple decades. We should applaud, welcome and assist innovations that improve automobiles instead of worry about improved cars discouraging walking/biking/transit. Cars aren’t the problem. They are incredibly efficient, especially at moving several people and their stuff over a large distance from point to point in a short period of time. The problem is that this tool is so poorly misused by most people that live far from work and drive their cars alone twice a day. They will complain that biking or transit doesn’t work for them, but the reason is because they drive along every day! I would love to own an electric car that could potentially be powered by renewables. But I don’t want a 5 seater capable of 100mph. Sell me one that holds 2 people and a grocery load, that goes 55mph, and I’d buy it right now. Read the post. It states in no uncertain terms that electric vehicles have a role to play in GHG reduction. But the “simplistic view” in this case is the belief that we should uncritically herald the arrival of autonomous EVs. Today, in the real world, there are no EVs running on 100% renewables (let alone the fabled robo-EVs). In the real world, there are concrete examples of cities enacting incentives to promote EVs that do detract from transit, biking, and walking. This is bad, dumb policy. We need greener cars, but more importantly we need fewer cars and less driving. If human beings don’t stop burning coal world-wide in the next five years we are all goners. Australia has absolutely got to stop shipping coal to China. It is certainly true that internal combustion engines are so wildly inefficient and squander the incredibly dense energy provided by gasoline in manner so ridiculous that our progeny will be one day be astonished at our stupidity and profligacy. However, it’s indisputably more energy efficient to replace internal combustion engine miles traveled (MT) with bicycles, walking and things that run on rails than to replace those MT with electric cars. It is even more energy efficient to reduce MT by people living closer to goods, services and where they work. Constrained energy resources of the future will demand both less total MT and more efficient MT. But there will still likely be some private electric cars around. More importantly, freight will likely be delivered by rail with electric trucks providing the last 0 – 20 miles of delivery to final destinations. If our family got an electric car, that car’s energy use would conceivably double our household’s electricity use. Our 3.0 kilowatt solar panel system right now covers our annual electricity consumption. Our roof is actually not big enough to double our solar PV system’s size. I really don’t want to ever buy an internal combustion engine again, so once the range of EVs increase and the time it takes to supercharge their batteries goes down to under 10 minutes we may invest in one but we will still have to be parsimonious with its use and probably get even more aggressive in reducing our household electricity use. If there were even a moderately good rail system up and down the West Coast (as opposed to the absolutely slow and pathetic one that exists) I think we would probably give up on a private car altogether and rely on transit, walking, biking, rail and carshare. It’s very important to note that the State of Victoria is about 90% powered by *brown* coal – pretty much the most greenhouse intensive generation there is. Black coal generation would improve the figures and natural gas even more so. If the same study was done in Tasmania (mostly hydro powered) the findings would be very different. The Union of Concerned Scientists’ study showed that even in the worst states in the US an EV was equivalent to a car getting 37 MPG. That is far better than the current average. And in the best states it was 100+ MPG. Sure, using wind and/or solar would make this even better, but it is already a win for the environment, your wallet, and our nation’s energy independence. @79d1efd3ddac47837b1a0ee3749a2226:disqus Ruining our global energy supply and economy by 2030 instead of 2025 is not a win for anyone. You hear the same argument made about electric trains. But look at the big picture — electric vehicles can be powered by renewables and contribute zero greenhouse gasses. Fossil fuel vehicles cannot. In the long term, we’d all be better off if people started switching to electric cars ASAP. Articles like this will just discourage people from doing so. #2 is a fantastic point, and one that’s important to even those who question global warming. I am in a quasi-rural area with terrible intercity transportation where I have to drive between cities regularly. So I have to get the 5-seater with the huge range, at least until our state government becomes sane enough to restore intercity passenger rail, and to improve the local bus service in the cities I’m going to. But you can get one of the shorter-range cars. derived from the South American Quechua language, and means ‘wind God’. Check out its sleek, aerodynamic shape and you’ll get it. You misunderstand me. I am a renewable energy advocate. My home (and EV) are solar powered. My point, however, is that you do not have to wait for a perfect grid before you stop using gasoline. Switch to an EV now (this will reduce GHGs) and work on improving the grid (or your little piece of it at least). I also agree with your point about reducing miles driven and more efficient vehicles. Look at the Arcimoto, it sounds like the kind of vehicle that you are asking for. Our car culture is changing, but for the times that you do need to drive, an EV (even with today’s grid) is better than gas (for the environment, for national security, and many other reasons). Thanks for the nice information.. looking for more information on this..